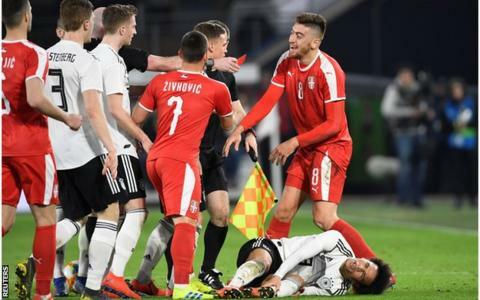 Germany head coach Joachim Low said Leroy Sane was "lucky" after a "vicious foul" on the Manchester City forward led to Serbia's Milan Pavkov being sent off as the sides drew 1-1. Sane hobbled from the pitch after the foul in added time at the end of the friendly. Serbia goalkeeper Marko Dmitrovic had produced an inspired display to prevent Joachim Low's new-look Germany from securing an opening win of 2019. "It was a vicious foul," said Low. "Sane was lucky and got away with not getting hurt but such fouls can break bones." Low's youthful side went behind to Luka Jovic's header in the 12th minute, before substitute Leon Goretzka hit the equaliser after the break. Germany dominated the early possession but Jovic was on hand to turn in the loose ball from six yards before Goretzka levelled with a fierce strike in the second half. Serbia were reduced to 10 men late in injury time after Milan Pavkov was shown a straight red for a reckless late foul on Manchester City's Leroy Sane. The 2014 world champions begin their Euro 2020 qualifying campaign against the Netherlands in Amsterdam on Sunday, 24 March, while Serbia travel to Portugal on Monday. Low made the surprise decision earlier this month to change the direction of the German national side by favouring youth over experience. Bayern Munich trio Mats Hummels, Jerome Boateng and Thomas Muller have been told they are no longer required, while Manuel Neuer was the only World Cup winner to start against Serbia. Germany retained possession well in Wolfsburg, although they struggled to carve out many chances in a disappointing first half. Their defensive frailties were exposed at the other end when they failed to clear their lines from the visitors' first corner, as the lively Jovic reacted quickest to convert from close range. Serbia could have been further ahead had they been more clinical in front of goal but a last ditch tackle from Lukas Klostermann prevented Jovic from doubling his tally. However, Borussia Dortmund forward Marco Reus was introduced off the bench and Germany began to exploit the Serbian defence which had looked so solid for 45 minutes. Leroy Sane began to pick up the ball in space as Reus' influence grew on the game, and Goretzka struck the equaliser with a fierce effort as Low's young side chased what proved to be an elusive winner. Germany's young charges may not challenge for major international honours in the immediate future but in the likes of Reus and Ilkay Gundogan, Low has enough role models to develop his freshling squad. The Germany boss was happy with his young side. He said: "In the first half the automation in this new team, playing together for the first time, did not function that well. "In the second half the team sent a very good signal that we can increase pressure and we can increase the tempo. We had a lot of chances and we missed the final touch a bit. That is also part of the learning experience. "Overall, I am very satisfied with the mentality, the pressure we created." Match ends, Germany 1, Serbia 1. Second Half ends, Germany 1, Serbia 1. Substitution, Germany. Nico Schulz replaces Leroy Sané because of an injury. Attempt missed. Timo Werner (Germany) header from the centre of the box misses to the right. Assisted by Jonathan Tah. Attempt blocked. Jonathan Tah (Germany) right footed shot from outside the box is blocked. Assisted by Ilkay Gündogan. Delay in match Leroy Sané (Germany) because of an injury. Milan Pavkov (Serbia) is shown the red card. Leroy Sané (Germany) wins a free kick on the left wing. Foul by Milan Pavkov (Serbia). Foul by Marco Reus (Germany). Antonio Rukavina (Serbia) wins a free kick in the defensive half. Leroy Sané (Germany) wins a free kick in the defensive half. Foul by Branko Jovicic (Serbia). Corner, Serbia. Conceded by Marc-André ter Stegen. Substitution, Germany. Thilo Kehrer replaces Lukas Klostermann because of an injury. Delay in match Lukas Klostermann (Germany) because of an injury. Corner, Serbia. Conceded by Lukas Klostermann. Substitution, Serbia. Branko Jovicic replaces Nemanja Maksimovic. Foul by Ilkay Gündogan (Germany). Milan Pavkov (Serbia) wins a free kick on the left wing. Attempt missed. Leon Goretzka (Germany) header from very close range misses to the left. Assisted by Joshua Kimmich with a cross following a corner. Corner, Germany. Conceded by Stefan Mitrovic. Leroy Sané (Germany) wins a free kick in the attacking half. Foul by Nikola Milenkovic (Serbia). Attempt blocked. Marco Reus (Germany) right footed shot from outside the box is blocked. Foul by Nemanja Maksimovic (Serbia). Substitution, Serbia. Stefan Mitrovic replaces Miroslav Bogosavac. Substitution, Serbia. Andrija Zivkovic replaces Darko Lazovic. Foul by Niklas Süle (Germany). Milan Pavkov (Serbia) wins a free kick in the defensive half. Corner, Germany. Conceded by Marko Dmitrovic. Attempt saved. Leroy Sané (Germany) left footed shot from outside the box is saved in the bottom right corner. Attempt missed. Marco Reus (Germany) left footed shot from the left side of the box misses to the right. Assisted by Marcel Halstenberg. Attempt missed. Marcel Halstenberg (Germany) header from the centre of the box is high and wide to the left following a corner. Attempt saved. Leroy Sané (Germany) left footed shot from the centre of the box is saved in the bottom right corner. Assisted by Marco Reus. Substitution, Serbia. Milan Pavkov replaces Luka Jovic.